A few weeks ago I attended an event at the Renaissance New Orleans Art Hotel. 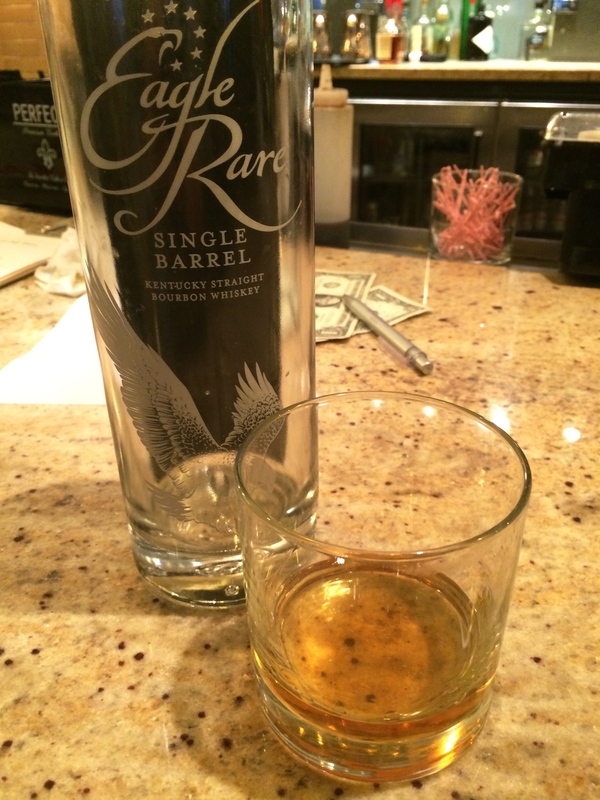 A buddy offered to buy me a drink, and after scanning the bar my eyes landed on an almost empty bottle of Eagle Rare. Bullseye. The bartender poured the rest in a glass (nearly an ounce) and handed it to me. I tasted Eagle Rare a few years earlier at another event, but didn’t care for it much. This time, however, I found it quite enjoyable. Eagle Rare is a 10 year old single barrel bourbon from Buffalo Trace, which means there will be variances from barrel to barrel. Unfortunately, I don’t see a barrel designation on the label. That means if you like what you taste, rush to the store where you bought this and pick up another bottle or two, because there’s a better chance those bottles are from the same barrel. My pour of Eagle Rare at the hotel impressed my friend Jeremy, who took a small taste from my glass. It’s 90 proof, smells sweet and oaky, and that’s what I tasted. Eagle Rare smells sweeter than it tastes, but that corn is there somewhere. There’s also lots of wood. It makes for an “earthier” tasting bourbon. The wood doesn’t overpower everything. It helps keep all the flavors more towards the balanced side of things. I really like this bourbon. So much in fact that I picked up the last bottle on the shelf at a high end liquor store in the New Orleans area for $28. When I get around to opening that, I’ll post any differences between the new bottle and the bar pour right here on Adventures In Whiskey. BTW, this looks to be the same slender bottles Buffalo Trace uses in their Antique Collection. Simple and classic. Have you tried Eagle Rare? If so, comment below and share your thoughts. I just picked up a bottle of this recently. Since your review, they’ve removed the Single Barrel designation. As I understand it, once BT moved to an automated bottling line, they couldn’t say it was single barrel anymore because during a switch-over, there will be a bottle that gets the last drops from one barrel and the first drops from the next barrel. Nonetheless, I believe it’s still a single (max double) barrel product. Anyway, my tasting notes are quite a bit different, but of course that’s to be expected from both a time difference and a single barrel perspective. I got a big kettle corn and Bit-O-Honey candy impression. I really like this one. And at the price, it’s hard to beat. Great review! Eagle Rare is still a staple at the house. I should review a current bottling to see how my previous notes compare.